Spring is now in full swing. We are enjoying the warmer weather, watching the flowers bloom, and looking forward to seeing our family and friends for Easter brunch. Since Easter brunch is one of our favorite events of the spring (besides opening day at Navy Yard, of course), we created our Easter brunch guide for you that has a few of our favorite recipes. With so many tasty recipes to choose from, it’s hard to determine what you should include in your brunch. Lucky for you, we found three great recipes that we’re going to make this Spring and thought you might like to try them too! 2. Different types of fruit drinks! Give a twist on this classic brunch drink by having not only orange juice, but grapefruit juice, pomegranate juice, and strawberry kiwi juice to mix with the champagne. 3. Fresh fruit as a garnish! Cut up some blueberries, strawberries, blackberries, and have orange slices ready to go for guests to top off their drinks. We saw this recipe from Cooktop Cove, tried it and are OBSESSED! No need to light a candle because this recipe will fill your house with the smell of vanilla and cinnamon. The best part about this recipe? It takes 10 minutes of prep work and then you turn on your crock pot on to let it work its magic. 1. Cube the bread and leave it out overnight so it goes stale. 2. Coat a 6-quart slow cooker with cooking spray and place the bread in it, covering its base. 3. In a large bowl, combine the eggs, the half and half, the heavy cream, sugar, vanilla extract, cinnamon, nutmeg, salt and rum (if you choose to use it). Whisk together and pour mixture over the bread cubes, making sure they're completely covered. 4. Sprinkle the walnuts and raisins over the mixture and cook for 3-4 hours on high or 6-8 hours on low. Pro tip: Substitute the raisins and chopped walnuts for chocolate chips or serve with maple syrup, a little bit of cream cheese and a side of fresh fruit. Even a light dusting of powdered sugar would be divine. Oh, and try not to drool as soon as you get a whiff of its divine smell. These Cadbury Egg Cupcakes are a chocolate lover’s dream and the perfect Easter dessert! We saw this recipe from Pizzazzerie and knew this would be a crowd pleaser to end our Easter Brunch! The only problem with this recipe is that there will be no leftovers for you to enjoy the next day! 2. Combine together cake ingredients and beat for 60 seconds on medium-high with electric mixer until fully mixed. 3. Fill cupcake liners 1/4-1/3 full and place in a Cadbury Egg (thick side first) down inside batter. 4. Top eggs with another 1-2 teaspoons batter. 5. Bake for 18-20 minutes (test for doneness by inserting a toothpick on the side of the cupcake, since the Cadbury Eggs are in the center). 1. Beat room temperature butter until creamy. Add in powdered sugar 1 cup at a time. 2. Beat in extracts, salt, and milk. 3. Add more powdered sugar or milk until desired consistency (thick enough to pipe on cupcakes). 4. Top cupcakes with frosting and enjoy! Have other ideas for an Easter Brunch Recipes? Let us know in the comments! 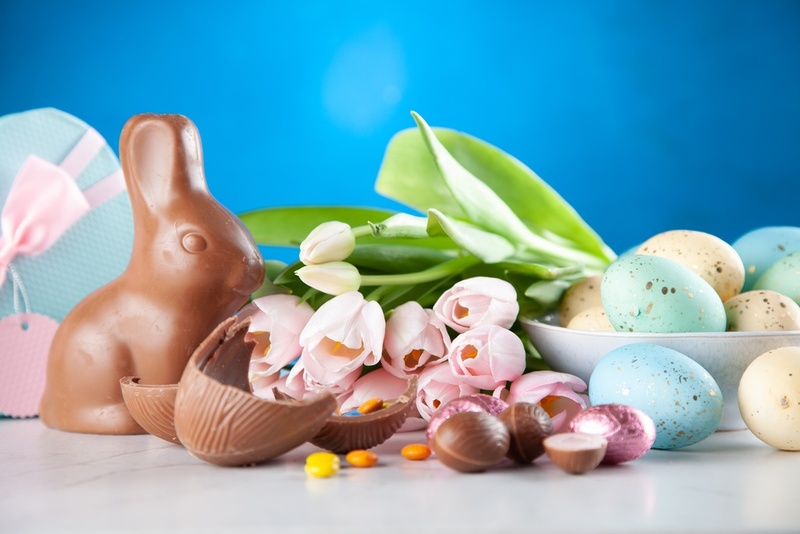 We’d love to incorporate some of your Easter traditions into ours this Spring!